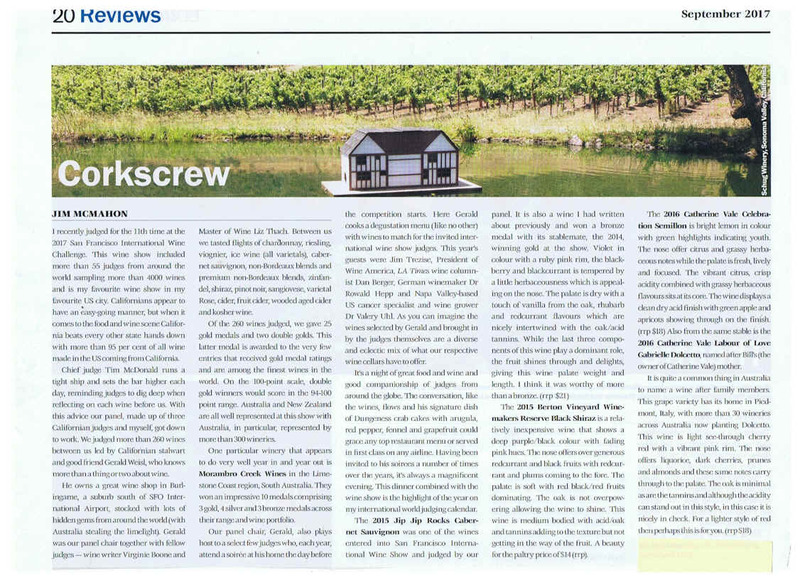 SF International Wine Competition JIM McMAHON ARTICLE "CORKSCREW"
I recently judged for the 11th time at the 2017 San Francisco International Wine Challenge. This wine show included more than 55 judges from around the world sampling more than 4000 wines and is my favourite wine show in my favourite US city. Californians appear to have an easy-going manner, but when it comes to the food and wine scene California beats every other state hands down with more than 95 per cent of all wine made in the US coming from California. Chief judge Tim McDonald runs a tight ship and sets the bar higher each day, reminding judges to dig deep when reflecting on each wine before us. With this advice our panel, made up of three Californian judges and myself, got down to work. We judged more than 260 wines between us led by Californian stalwart and good friend Gerald Weisl, who knows more than a thing or two about wine. He owns a great wine shop in Burlingame, a suburb south of SFO International Airport, stocked with lots of hidden gems from around the world (with Australia stealing the limelight). Gerald was our panel chair together with fellow judges � wine writer Virginie Boone and Master of Wine Liz Thach. Between us we tasted flights of chardonnay, riesling, viognier, ice wine (all varietals), cabernet sauvignon, non-Bordeaux blends and premium non-Bordeaux blends, zinfandel, shiraz, pinot noir, sangiovese, varietal Rose, cider, fruit cider, wooded aged cider and kosher wine. Of the 260 wines judged, we gave 25 gold medals and two double golds. This latter medal is awarded to the very few entries that received gold medal ratings and are among the finest wines in the world. On the 100-point scale, double gold winners would score in the 94-100 point range. Australia and New Zealand are all well represented at this show with Australia, in particular, represented by more than 300 wineries. One particular winery that appears to do very well year in and year out is Morambro Creek Wines in the Limestone Coast region, South Australia. They won an impressive 10 medals comprising 3 gold, 4 silver and 3 bronze medals across their range and wine portfolio. Our panel chair, Gerald, also plays host to a select few judges who, each year, attend a soir�e at his home the day before the competition starts. Here Gerald cooks a degustation menu (like no other) with wines to match for the invited international wine show judges. This year�s guests were Jim Trezise, President of Wine America, LA Times wine columnist Dan Berger, German winemaker Dr Rowald Hepp of Schloss Vollrads in the Rheingau, Mike Tadich, a Las Vegas wine guru who's an Italian wine expert and Napa Valley-based US cancer specialist and wine grower Dr Valery Uhl. As you can imagine the wines selected by Gerald and brought in by the judges themselves are a diverse and eclectic mix of what our respective wine cellars have to offer. It�s a night of great food and wine and good companionship of judges from around the globe. The conversation, like the wines, flows and his signature dish of Dungeness crab cakes with arugula, red pepper, fennel and grapefruit could grace any top restaurant menu or served in first class on any airline. Having been invited to his soirees a number of times over the years, it�s always a magnificent evening. This dinner combined with the wine show is the highlight of the year on my international world judging calendar. The 2015 Berton Vineyard Winemakers Reserve Black Shiraz is a relatively inexpensive wine that shows a deep purple/black colour with fading pink hues. The nose offers over generous redcurrant and black fruits with redcurrant and plums coming to the fore. The palate is soft with red black/red fruits dominating. The oak is not overpowering allowing the wine to shine. This wine is medium bodied with acid/oak and tannins adding to the texture but not getting in the way of the fruit. A beauty for the paltry price of $14 (rrp). The 2016 Catherine Vale Celebration Semillon is bright lemon in colour with green highlights indicating youth. 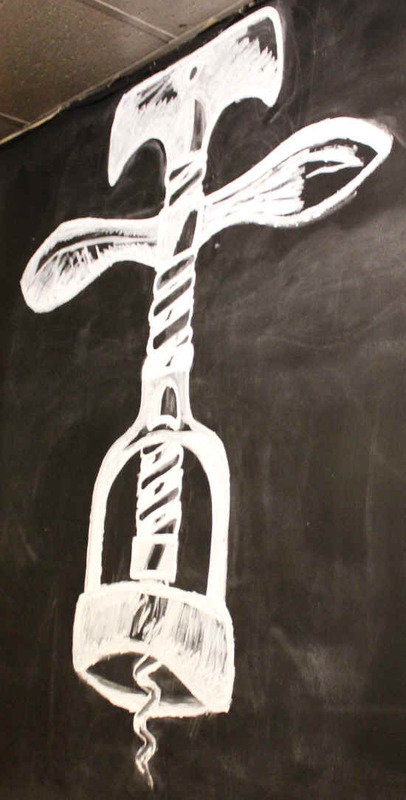 The nose offer citrus and grassy herbaceous notes while the palate is fresh, lively and focused. The vibrant citrus, crisp acidity combined with grassy herbaceous flavours sits at its core. The wine displays a clean dry acid finish with green apple and apricots showing through on the finish. (rrp $18) Also from the same stable is the 2016 Catherine Vale Labour of Love Gabrielle Dolcetto, named after Bill�s (the owner of Catherine Vale) mother.